Celebrate a special occasion in style with this magnificent combination of sparkling Rosé wine and delicious Maison Fougère chocolates. Show just how much you care with this fun gift of balloons and bubbly. Imagine their surprise and delight when they see three bright red heart balloons displaying those magic words 'I love you' for all to see. This gift also includes a bottle of sparkling rosé to add to that extra special feeling. This gift is sure to make them smile with pleasure. Make a big impression with this fabulous balloon bouquet which is created with six helium-filled balloons. 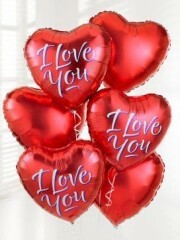 Including three red heart-shaped balloons and three 'I love you' balloons, you can really show someone you care. Our balloon bouquets can be also ordered as a finishing touch when you purchase from our floral range. Classic and with a timeless charm and elegance, the gift of red roses is still one of the most evocative gestures. 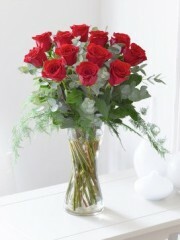 This selection of large-headed scarlet roses looks simply magnificent arranged in a tall, elegant glass vase. It’s a traditional gift that can be displayed on arrival. 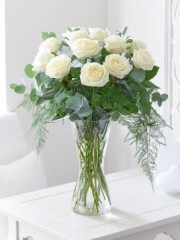 For simple sophistication and effortless chic, it’s hard to beat this gift of pristine white roses. We’ve chosen a large-headed variety, added extra foliage in the deepest green and carefully arranged everything in a tall glass vase. This is a classic gift that really speaks for itself. Velvety smooth roses are a timeless classic. Here we’ve chosen a luxurious variety in a sweet shade of marshmallow pink and added the darker toned pink of the lisianthus and the contrast of fresh white freesia. The result is a wonderfully feminine gift that is sure to please. 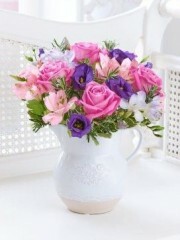 This floral jug arrangement is a wonderfully uplifting gift. Not only does the combination of stunning pink luxury roses and delicate lilac freesia look sensational, this gift also has a fresh fragrance to enjoy too. 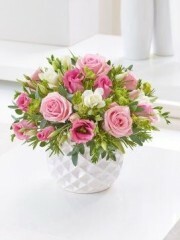 For a variation on the traditional gift of roses, why not send this lovely rose basket? 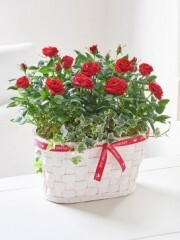 We’ve taken two miniature rose plants in rich red and carefully planted them in this pretty woven basket. It is a delightful gift that will bring a smile to their face – and some colour to their room. This stylish gift box combines a bottle of Le Dolce Collini Prosecco with delicious chocolate truffles from Maison Fougère – a perfect combination for any celebration. Romantic flowers can be given to your loved one at any time, whether there’s a reason to celebrate or just as a really thoughtful surprise that will let them know how much you care for them. 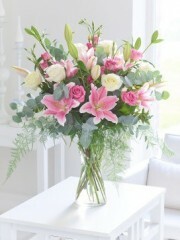 At Dundee flowers we have many options of hand tied bouquets for that personal touch. Many of our bouquets consist of deep reds and gorgeous pinks which symbolise passion and love. Nothing says “I love you” like a luxurious bouquet of roses, something simple and beautiful that will let your partner know how much you love them. At Dundee flowers we don’t stop at flowers we have boxes of luxury chocolates and bottles of bubbly and wine that can easily be added to your order to push the boat out even further. Balloons and teddies are also available from our Dundee Florist. So spoil your man or lady properly and let us wrap and present your flowers beautifully. We will even deliver them directly so there’s no fuss and all that’s left to do is enjoy giving your partner something to smile about. We are able to deliver around Dundee sometimes even on the same day, if requested, next day and future delivery is also available if you are planning ahead or have a specific date in mind. Whatever you chose our team at Dundee flowers will carefully arrange your chosen flowers and gifts and present them in the best way we can to ensure your partner feels the love you are sending their way.